The number of static electricity incidents reported in the U.S. exceeds more the 250 a year. The reports of these incidents are way more common that you would like to think. Certainly, when electrostatic charge build-up exists in a flammable or explosive environment a very hazardous situation has been created. Typically these situations can be avoided by installing high quality low resistance grounding/ bonding cables containing clips and clamps. The clips are required to maintain high clamp pressure and the clamps will need to have a paint piercing point to be effective in garnering a solid metal on metal connection to reduce resistance and reduce static. The clips and clamps can be connected to a braided copper cable or better yet, a stainless steel wire rope which tends to hold up better in industrial applications. Make sure the connections to the cables are tight and always test the assembly for low resistance, the closer you get to 1 OHM the better. Grounding / bonding cables don’t always guarantee static dissipation. 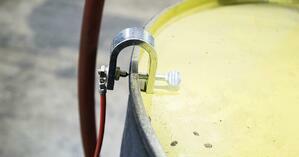 Many times a grounding or bonding cable is attached to an object (tank or pump) which has been coated for protection. These types of coatings can impede the clip or clamp’s ability to make a solid metal to metal connection, which in turn, increases the resistance within the grounding structure. With increased resistance comes the possibility of electrostatic discharge failure. 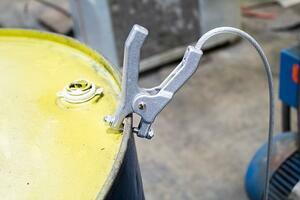 Rust build up on the clip or clamp can also create a coating which will disrupt a solid metal to metal connection. As a result, this too will create an unsafe environment. To avoid these situations, always test your grounding / bonding cable’s connections for resistance at the time of employment. If the resistance is low, great! Move on. If the resistance is high, make the necessary adjustments to insure a solid connection and low resistance. Don’t take a chance, make sure a solid connection is evident before giving it your seal of approval. Proper maintenance is also critical to insure that your grounding / bonding equipment is in proper condition to effectively reduce static. Regular inspections of your grounding / bonding equipment are a necessity in any industrial setting. As you know, industrial environments can and will severely test the structural integrity of any device, including grounding / bonding cables and assemblies. Remember, inspect what you expect! In conclusion, plant safety goes well beyond the need for appropriate attire and traffic flow logistics throughout the plant. Electrostatic discharge, the invisible threat, will need to be addressed as well. High quality, low resistance affordable grounding / bonding equipment is readily available to provide the required protection. Appropriately placed grounding / bonding cables and assemblies along with consistent resistance testing will provide a safe work environment for everyone.